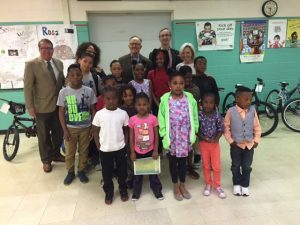 For more than 10 years RCM’s Partners in Education Committee (PIE) has been helping MPS K4-5th Grade Brown Street Academy (BSA) in a variety of ways. Transportation to and from swimming lessons for all BSA second graders. After the tragic drowning of a young BSA student, Principal Ava Brown curried reduced-price YMCA swimming lessons for BSA students. Urban Ecology Classes. Every student at BSA spends one week at the Urban Ecology Center learning valuable lessons to help protect our environment. RCM provides half the funding. Uniforms. Uniforms have proven to be useful tools in keeping students focused on learning and mitigates dress-code violations. Community Event Sponsorship. At the end of each school year BSA hosts a community-wide event featuring games, food and summer reading distributions. Each year more than 500 people attend. Mad Hat Ballroom Dancing. RCM provides funding for the dance teachers to come to BSA and for students to field a team at the annual competition. Playworks. Along two other funding partners, RCM supports the Playworks program at BSA. Playworks helps kids stay active and build valuable social and emotional skills through play. *A Rotary 6270 District Grant covered $3,000 of this funding. And, finally, the keystone program is the RCM Reading Initiative. Started in 2012 by Rotarian Barbara Velez, each semester Barbara rounds up more than 60 volunteers to help tutor students who are performing below grade level in reading. Barbara assigns a volunteer to every BSA classroom, Monday through Friday, from 8 a.m. until 11 a.m. Volunteers are Rotarians and service learners from the University of Wisconsin-Milwaukee. In the past six years, more than 700 volunteers have been placed at BSA under this program. The Most Improved Reader from every classroom are selected based on test scores. Students are tested at the beginning of each semester and then again near the end. Some students have improved their reading by more than 40 points! The Most Improved Reader for each class (a boy and a girl) is given a new bicycle courtesy of RCM. The RCM Reading Initiative is working. BSA students have significant challenges – nearly 25% are special needs students and more than 20% of the students attending in the Fall will have moved from the BSA area by Spring. Despite these barriers to learning, overall, BSA students have shown a 74% improvement in their reading scores.